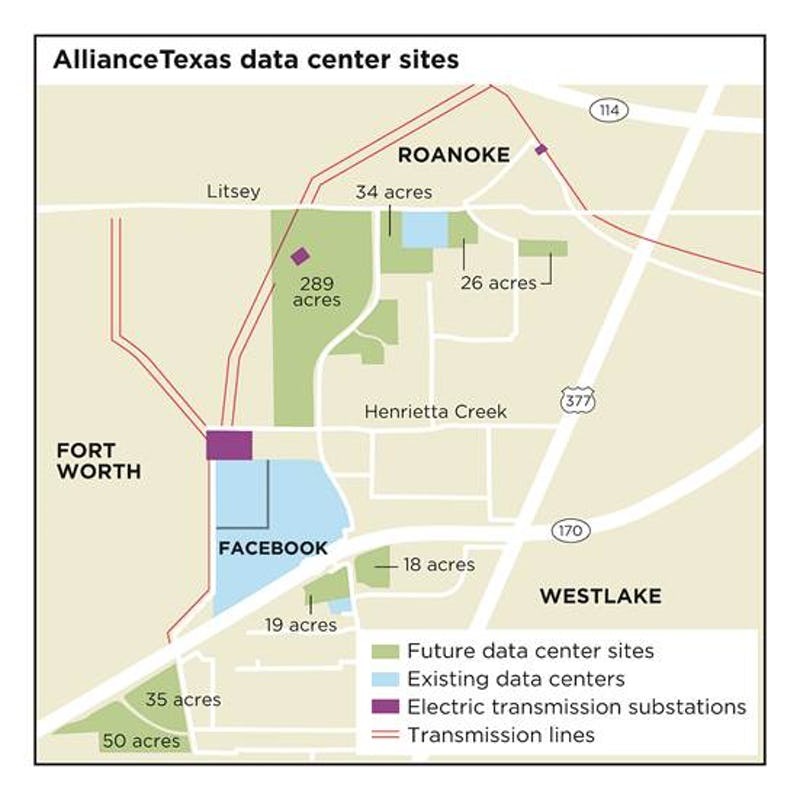 Facebook’s Texas data center may soon have some neighbors of similar scale. Wind in its sails in the form of funding from equity investor IPI Data Center Partners Management, T5 Data Centers hopes to build a large cluster of hyper-scale data centers for some of the world’s largest tech companies in north Fort Worth, around a recently launched server farm by one of those companies: Facebook. But other than marking the sprawling master-planned AllianceTexas development as a “dot on the map for other hyper-scalers,” T5 COO Aaron Wangenheim doesn’t imagine Facebook will play a role in the vision. “What we’re really trying to do is replicate what Facebook has done there for one of the other guys,” he said in an interview with Data Center Knowledge. One or more. 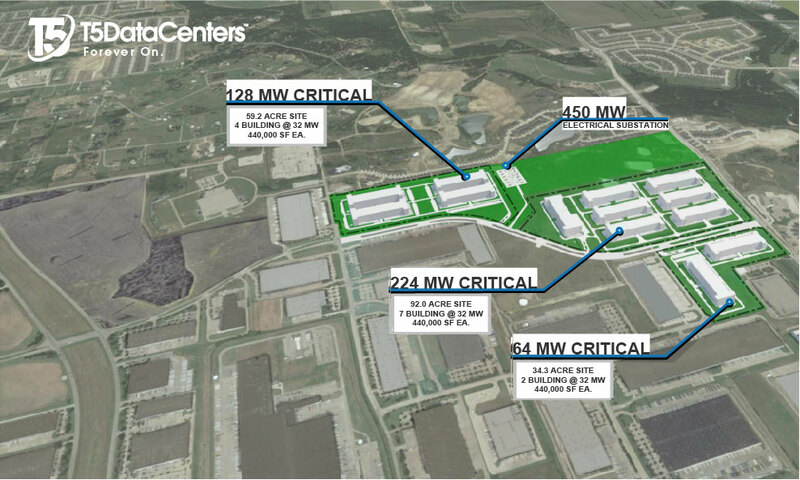 Hillwood, the developer that owns 18,000-acre AllianceTexas, has set aside 350 to 400 acres of the master plan for data center construction. In addition to Facebook, the development is also home to a Blue Cross and Blue Shield Association data center (acquired earlier this year by QTS Data Centers), data centers occupied by AIG and Citigroup, offices of about 470 companies, as well as retail, restaurants, medical offices, and apartments. T5, IPI, and Hillwood are marketing pre-approved plots of land with entitlements and power infrastructure in place, ready for construction. The partners have taken several big steps that typically slow down a data center construction project for whatever company decides to move in. The expectation is that Amazon, Microsoft, Apple, or another player of that scale will be attracted to a site that’s not only in one of the hottest data center markets in the world but also doesn’t require months if not years of going through planning bureaucracy, tax-break negotiations, power provisioning, and infrastructure building. “It’s really ready for design, and subsequent to design, it’s basically shovel-ready for any of these guys,” Wangenheim said. T5 would take a client’s design and build and operate the data center for them, while IPI – a fund manager co-sponsored by Iconiq Capital, a wealth management company that serves the likes of Facebook founder and CEO Mark Zuckerberg and LinkedIn co-founder and Chairman Reid Hoffman – would fund the construction project. “We have the capital stack ready to go to begin development,” he said. Size of the IPI fund hasn’t been publicly disclosed, and Wangenheim said he couldn’t share much detail about the investor. “IPI is still in fund-raising,” he said. Iconiq registered its data center investment arm, Iconiq DC Management, last August, and made its first bet by taking an equity stake in T5 data centers in Dallas and Portland the following September for an undisclosed sum. T5 and IPI are now looking for an anchor tenant for Fort Worth, focusing on hyper-scale cloud operators. The partners aren’t after multi-tenant data center providers at this point, he said, although Dallas-Fort Worth is extremely popular among them, and for a good reason. The market has seen some of the fastest absorption of data center capacity in recent years. The amount of capacity leased there in the first half of 2017 was second only to Northern Virginia – the largest and hottest data center market in North America and possibly in the world. Companies leased 22MW in the first six months of the year, according to a recent market report by the commercial real estate firm CBRE. While the market didn’t see a lot of leasing by hyper-scale cloud companies in the first half of the year, authors of the CBRE report said they saw evidence of that changing. And T5 isn’t the only player chasing those opportunities; there were 10 active multi-tenant data center construction projects under construction in Dallas-Fort Worth as of the end of June, according to the report, totaling close to 47MW, all projects built speculatively, or without anchor tenants secured, which according to CBRE spoke to strength of the deal pipeline in the market.